Players must be aged 18 or over. Offer only available to new players unless otherwise specified. Offer can only be redeemed once. 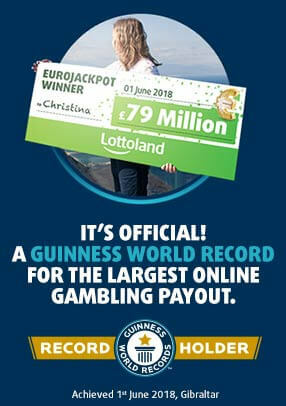 Only one Lottoland account per person, per household. Offers cannot be used in conjunction with any other promotion. Player must make a real cash purchase of minimum amount £2. Bonus amount will be the equivalent value of 4 lines up to a maximum of £8. Bonus only applies to the first or next real cash purchase. Bonus will automatically be applied in checkout section and it is the player’s responsibility to check their shopping cart before confirming the transaction. Any participant found to be operating multiple accounts in promotions will be in breach of these and general account terms and the promoter will determine at its sole discretion by whatever means it deems necessary to establish if different entries or accounts are connected to the same person. Bonus offers are limited to one bonus per person, and/or payment method unless otherwise stated. Participants, whether individually or acting in a group, will be found to be in breach of these and promotional specific terms if the promoter at its sole discretion has reason to believe that a promotion has been abused, manipulated, or that irregular, fraudulent, collusive or illegal activity has occurred. The decision of the promoter in all promotional matters is final and no correspondence will be entered into. The promoter reserves the right to withhold promotional benefits until resolution of any dispute. The decision of Lottoland Limited in respect of any matter concerning or related to competitions and promotions is final. In the event of a breach of these terms and conditions Lottoland Limited reserves the right to take such action as it deems appropriate in its absolute discretion. Lottoland reserves the right to amend or withdraw any offer at any point for whatever reason. Lottoland Limited general terms and conditions apply.